Two aerial ladder trucks spray water on the Pacific Recycling Center fire early Sunday morning. A large fire broke out late Saturday night in a stack of salvage vehicles at Pacific Recycling Center on Palmer Street in Missoula, MT. When Missoula Fire Department reached the fire, crews found 30-foot flames burning the group of vehicles while propane and other fuel tanks exploded. 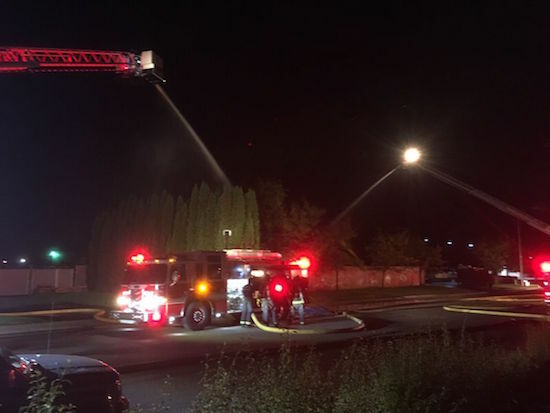 Crews, worried about a larger fuel tank and the eight-foot fences around the site of the fire, used aerial ladder trucks to spray water on the fire from a safe distance. Assistant Chief Jeff Brandt said the fire’s complexity was “why we rolled as many people as we could, with the hazardous materials and oils” that were in the recycling yard. A Pacific Recycling employee also used an excavator to break the pile of vehicles down and helped stabilize the fire in less than an hour. Twenty-three firefighters were on scene while the Missoula Police Department and Missoula Emergency Services responded as well. The cause of the fire is unknown, but a fire investigator is currently on scene.